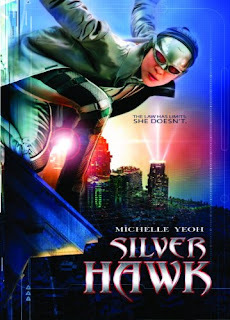 Silver Hawk. I'd never heard of it. I looked at the back of the box. Luke Goss (Hellboy II: The Golden Army)? Okay, could be worse. Michael Jai White (Black Dynamite). Okay. And, of course, Michelle Yeoh (Sunshine). Excellent. So it's a superhero film. Low budget. Mostly English language, heavily martial arts inspired. The plot is...well, she's Batman, Luke Goss is Alexander Wolfe (Um, the bad guy), and there's some nefarious plot to take over the world or some such, and a lot of punching and kicking. Writer / director Jingle Ma (Tokyo Raiders) does a spot on job at creating the film to be exactly what it is. No, it'll never win Oscars - but it is an over the top action film, splashed with fantasy. All involved wear their heart on their sleeve, too. Yeoh is outstanding, and Goss knows how to play the villain. And we all know what a Dead Celluloid favorite Michael Jai White is. It's a martial arts, super hero, science fiction, action fest, with an unnecessary love story thrown in for good measure. All at just over 95 minutes. Being standard PG-13 fare, with virtually no blood, and only one marked death (and that was as off-screen as they could make it), overall, it's pretty kid friendly. With a few flashbacks to ascertain characters without messing about with actual character development in the film, it comes across a little like a TV show pilot. Which is a shame. With a larger budget and a longer running time, it could have easily matched other films takings that year. Coming out the same year as Hellboy and Spider-man 2, the super hero genre was in full swing. It's fun, fast, and keeps your eyes on the screen. Between the fights, the bike chases, mustachio-twirling villains and low budget effects, it's a cracking time.